Musical instruments used are the same. They are : Dhol, the barrel shaped drum with two faces; Dhumsa or Dhak, a land of huge kettledrum; and Mahuri, the reeded wind instrument like Shehnai, but with a sharper timbre. Because of the generous and enthusiastic patronage of the erstwhile princely states, the Mayurbhanj and Seraikela styles of Chhau are highly evolved and have all the desired elements of a classical dance. 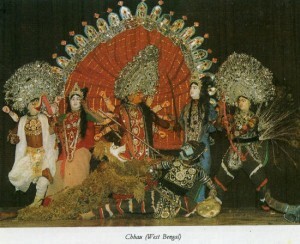 Purulia Chhau, although less evolved, is highly dramatic and the most vigorous of all styles of Chhau. In absence of clear evidences, there are differing opinions on the origin of Chhau dances. One that appears most reasonable is that they have evolved out of the martial crafts. The earliest number in the repertoire of Mayurbhanj Chhau is Ruk-maar-nacha which literally means the dance of attack and defense. Similarly, the base of Seraikela Chhau is Phari-Khanda Khela, meaning the play of sword and shield. Each number of Purulia Chhau culminates in a confrontation between two warriors. Two forms of folk dance still surviving in some of the remote villages in Orissa, which have leg extensions exactly like that of Chhau, are Paikali (check Game and Martial Dances Folk Dances) and Amdalia-Jamdalia Nacha in which the dancers decorate themselves with and dance holding small branches of mango and jamun (a kind of deeply purple colored plum) trees. In some of the numbers in these two forms of dance masks without eyeholes are used. Surely these two dances are the precursor of Chhau. With masks the Seraikela Chhau takes fantasy to the summit of poetry, where beauty is distilled from a world of magnificent dreams; and Purulia Chhau vibrates with a theatricality that makes out myths palpable. Without mask the movements of Mayurbhanj Chhau become visual poetry of stormy passion gestured in a style that is free, intense, and affluent; a poem that is ablaze with Nature – her storms, her volcanoes, her rivers, and her lagoons.